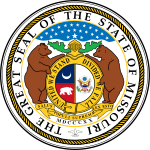 The 2012 Missouri gubernatorial election was held on November 6, 2012, to elect the Governor of Missouri. Incumbent Democratic Governor Jay Nixon won re-election against the Republican nominee, businessman Dave Spence. The Democratic primary was held on August 8, 2012. Nixon won with a comfortable margin, even though it was a little closer than his 2008 victory. Even with President Barack Obama losing the state by a nine-point margin, Nixon and Senator Claire McCaskill both won reelection easily. Nixon, like McCaskill was able to get a huge number of votes from rural areas. Both Nixon and McCaskill were declared the winners of their respective races, even before the known Democratic strongholds of St. Louis, and Kansas City came in. ^ a b c d e f g Redden, Susan (April 2, 2012). "Susan Redden: Candidates for governor, lieutenant governor total 23". The Joplin Globe. Retrieved May 25, 2012. ^ "Gov. Nixon confirms he will seek re-election". Associated Press. December 16, 2010. Archived from the original on July 29, 2012. Retrieved December 16, 2010. ^ "Governor candidate Randles: Voters reject 'next guy in line' philosophy". 25 August 2011. This page was last edited on 17 April 2019, at 07:11 (UTC).